It finally happened. The Avengers: Endgame trailer finally dropped early this morning. And it arrived with a quiet calm that is still unnerving fans across the globe. It's a teaser in every sense of the word, and only offers up cliffhanger after cliffhanger, instead of giving us any real closure to the events seen in Infinity War. This is going to be dark. You can tell from the tears rolling down Captain America's cheeks. Not much is shown in the first Endgame trailer. But what we do see is quite devastating. This first look sneak peek opens with Iron Man's battle damaged helmet as Tony Stark floats through the cold dead vastness of space. He isn't doing so well. He records one final message to his finance Pepper Potts. He truly believes he's about to die. "Hey, Ms. Potts. If you find this recording, don't feel bad about this. Part of the journey is the end. Just for the record being adrift in space with zero promise of being rescued is more fun than it sounds. Food and water ran out four days ago. Oxygen will run out tomorrow morning. And that will be it. When I drift off, I will dream about you. It's always you." Just try to hold back those tears. We see Tony Stark staring out the window of his spacecraft. Everything goes dark. And it appears to be pretty bleak for one of the most iconic superheroes of all time. 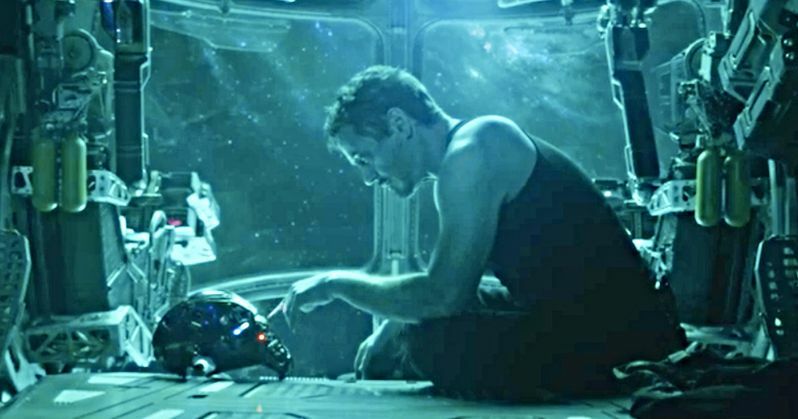 Speculation has Tony Stark not making it out of Endgame alive. They won't possibly let him die alone in space, will they? It's the perfect cliffhanger, and perhaps this is the only trailer we need leading into the release of the movie this summer. Most of the surviving Avengers get at least a few seconds of screen time in this first teaser. Most of the 2:25 runtime is given over to Captain America and Black Widow. First, we see Thanos' armor hanging like a scarecrow as he limps through a field. Steve Rogers cries, as Natasha explains what happened after the decimation. Bruce Banner appears to be scrolling through the missing Avengers. We see Scott Lang, who is unknowingly lost in the Quantum Realm, Peter Parker, and most surprisingly, Shuri, who we were assured was still alive after Thanos' snap heard around the universe. Thor sits pensive, contemplating his next move. We only see him for a few fleeting seconds. Nebula is lurking around the shadows of her ship. Then comes the big Ronin reveal we've all been waiting for. Jeremy Renner returns as Hawkeye for the first time since Captain America: Civil War was released in 2016. He has become a rogue assassin. Here, we see that he has taken out members of the Yakuza in the streets of Japan. He is confronted by Black Widow. Captain America stares longingly at an old photo of Agent Carter as he declares that this is, 'The fight of our lives.' Natasha and Steve have a plan. But will it work? Believed to have been killed with the rest of the universe, Scott Lang suddenly appears at Captain America's front gate. Somehow he has escaped the Quantum Realm on his own. He is alive. And it looks like he has some urgent information. All of this is wrapped up with that glorious title reveal. It's just one hook after the next. And we're set for the adventure of a lifetime. Marvel Studios released the first trailer early this morning, and after just a few hours, it already has over 90 thousand views and counting. The trailer currently has 207K likes and only 1K dislikes, so it's resonating strong with fans this morning. You can take a better look at the action in the images provided below.